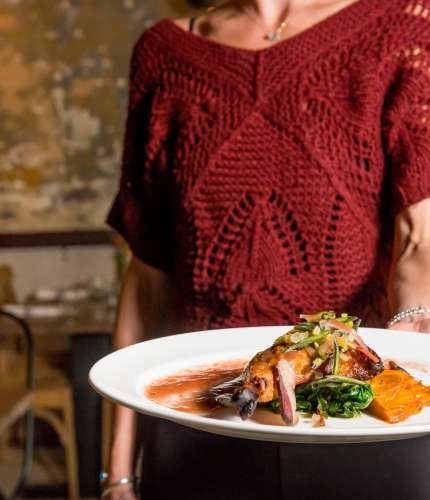 Asheville, North Carolina, a city surrounded by the natural beauty of the Blue Ridge Mountains and named among the top destinations for 2019, has become one of America’s hottest food scenes. Cradled by one million acres of pristine forests and hundreds of family farms—including the agricultural legacy of George Vanderbilt&apos;s Biltmore Estate—food culture in Asheville has gained national attention as a small-but-mighty hub for culinary creativity where Appalachian food traditions, global perspectives and artisan goods go together like a picnic and the Blue Ridge Parkway. Asheville’s collaborative food community has a rich legacy of living off the land. Chefs work directly with regional cheese makers, bakers, apiaries, flower farms, foragers, potters, dairies and family farms in a melting-pot food scene that is innovating cuisine, unearthing tradition and nabbing more James Beard nominations than the average small city. Whether you’re a first-time visitor, or well-acquainted with our cool mountain getaway, here are 50 ideas to help you see, do, and explore the best Asheville has to offer. Appalachian cuisine in Asheville is no mere trend. It’s a way of life with roots as deep as these mountains are old. Stroll through a lively entertainment hub in the heart of Asheville, brimming with independent shops, farm-fresh eateries, and a remarkably distinctive mountain vibe. 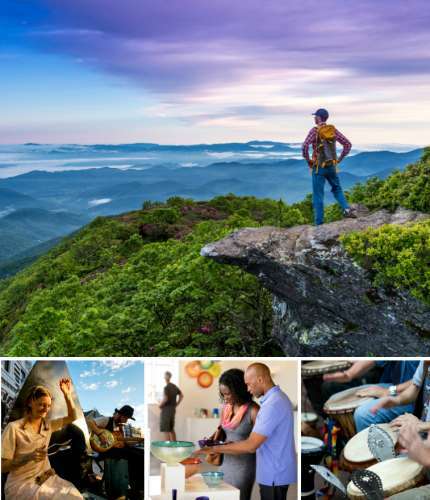 Beyond the plate, Asheville offers immersive adventures of all kinds—from hiking trails to live music, vibrant visual arts to rejuvenating spa experiences. 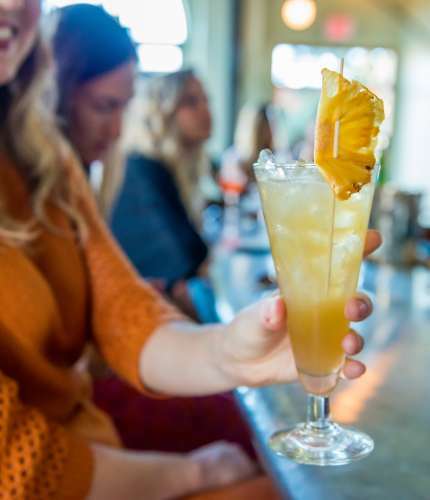 Our foodie visitors enjoy guided foraging expeditions in the woods; they drink in mountain views atop rooftop bars; they sip Biltmore Estate-grown wines at America’s most visited winery; and they sample their way across farm tours, cheese trails, chocolate factories and farmers markets. If craft beer is your passion, Asheville is a virtual beer garden. 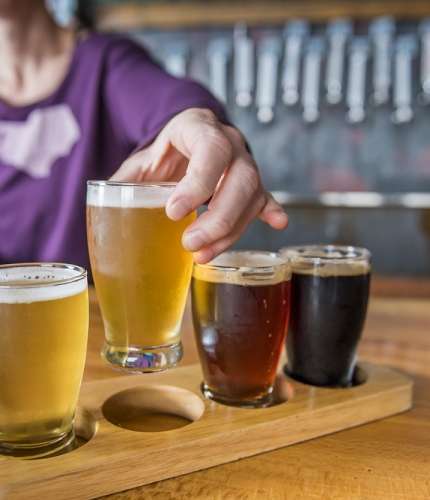 Closing in on 50 breweries—more per capita than any other U.S. city—the Asheville area is leading the industry with homegrown brewing icons, major craft-beer brands, and colorful breweries and tasting rooms where good vibes and good beer sync up in interesting ways. Try a pint in an antique caboose, a space-invaded movie house, on a mountainside farmstead or in an art enclave along the third oldest river in the world. Asheville’s success with craft beer has naturally given rise to a burgeoning craft spirit and beverage scene. The city is now brimming with artisan moonshine, multiple cideries, rum and gin distillers and makers of saké, mead, kombucha and Appalachian-foraged amaro. This inspired, friendly and free-spirited city tucked in the mountains of Appalachia has been called “Foodtopia,” but the locals just call it home. Plan a trip at ExploreAsheville.com. Designed as an inviting retreat and an immersive getaway, Kimpton Hotel Arras offers a crafted experience drawn from the culture of Asheville. A historic conversion of the former BB&T Bank building, Kimpton Hotel Arras transforms Western North Carolina’s tallest building into a 128-room boutique hotel, bringing a modern mountain aesthetic to life with locally curated artwork, culinary craftsmanship and a laid-back-meets-luxe experience. 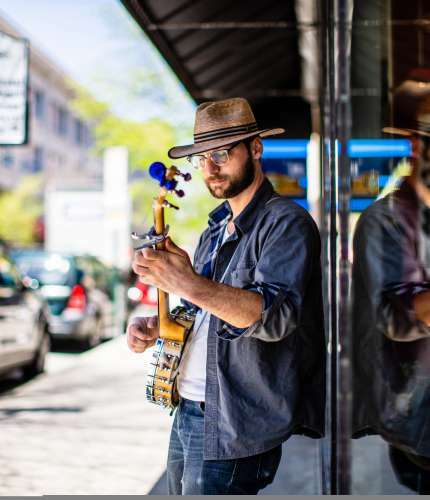 Located at the heart of downtown Hotel Arras captures the essence of the eclectic Asheville arts community and is a symbol of the city’s storied past and bright future. Discover a chic, urban lifestyle experience at Aloft Downtown Asheville. Set in downtown Asheville, NC, in the heart of the Blue Ridge Mountains, our hotel is steps from the world-renowned culinary and art scene. Pick your view, we offer mountain & city views as well as poolside cabana rooms. Gather with friends at W XYZ Bar with a balcony overlooking downtown Asheville. Pets stay free at our pet-friendly hotel. Special $279 per night Chow Chow Rate, Book Here. Connect to Asheville in a new way at AC Hotel Asheville Downtown, where every detail is inspired by local culture, clean design and the needs of the modern traveler. No matter what’s on your agenda, the best of Asheville is easily accessible from our front door. Special $289 per night Chow Chow Rate, Book Here. Experience Asheville in a whole new way when you stay at the Cambria Downtown Asheville! Located in the heart of downtown, the Cambria offers boutique accommodations, a full range of tech-forward amenities, and a refreshingly relaxed vibe that echoes the dynamic spirit of the city itself. Welcome to Cumberland Falls Bed & Breakfast, a boutique inn surrounded by beautiful gardens and koi ponds. Nestled in Historic Montford, a quiet neighborhood walking distance to downtown. Your stay with us is all inclusive from beverages to baked treats, parking, and of course…a bountiful breakfast. Come relax and enjoy. Estate. The 87-room boutique hotel combines three historic buildings with two new builds and retains several original design elements such as the former elevator pulley system and steel-star fastenings. Tucked within Asheville’s historic Biltmore Village, Grand Bohemian Asheville, a Kessler Collection boutique property, is a European lodge-inspired boutique hideaway, reflecting the eclectic, edgy artistry of Asheville, along with the richness of the Blue Ridge Mountains. The Tudor inspired hotel boasts 104 luxe guestrooms and suites. Welcome to walking distance of over 200 locally owned restaurants, shopping, entertainment and all things eclectically Asheville. Our newly constructed hotel offers a genuine welcome with unrivaled mountain and city views, from the guestrooms to our rooftop bar, The Montford, which is open daily. The finest amenities. An oasis of service, style, and charm. A stay overnight at The Inn on Biltmore Estate means experiencing the same gracious hospitality enjoyed by George and Edith Vanderbilt’s guests. You’ll feel at him in any of our guest rooms and nine suites, surrounded by casual elegance and catered to at every turn. Comfortably elegant five bedroom inn, Pinecrest sits on an acre of lush gardens in the desirable Montford historic district, one mile to downtown Asheville, three miles to Biltmore Estate. Serving indulgent breakfasts, fresh baked cookies, and complimentary beverages on our sunporch. Let innkeepers Dan and Diane make your trip memorable. Nestled in Biltmore’s Antler Hill Village just steps from the Winery, Village Hotel on Biltmore Estate occupies a central-to-everything location near quilt-like farm fields that stretch along the banks of the French Broad River. Stay here to be close to shopping, dining, exhibits, and an exciting range of outdoor activities. With more breweries per capita than any other U.S. city, craft beer thrives in the mountains. 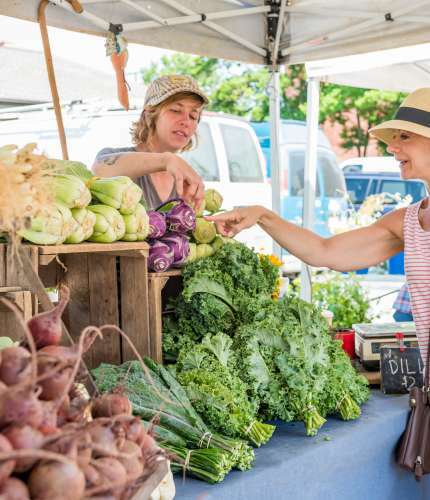 Visit one of Asheville's nearly 20 tailgate markets and you'll likely be rubbing elbows with some of the finest chefs in town. The craft beverage community is dynamic, creative and dedicated to making quality drinks of all sorts, from mead to kombucha, spirits to soda, and sake to tea.